Learning is an inherently social and collaborative activity in which individual learning processes are interdependent and dynamically interlinked with each other: the output of one learning process is input to the next. If we have a look at this phenomenon from a macroscopic perspective, we can observe a knowledge flow across different interlinked individual learning processes. The knowledge becomes less contextualized, more explicitly linked, easier to communicate, in short: it matures. goal-oriented describes knowledge maturing as a process with a direction. The goal can be an individual goal (e.g., deepen understanding in an area out of curiosity), a team goal (e.g., grasp known errors with respect to a product that the team works on), or an organisational goal (e.g., refine an organisation‟s core competency). Goals typically change over time and get aligned in social processes, resulting in a direction as a (mostly a posteriori) interpretation. 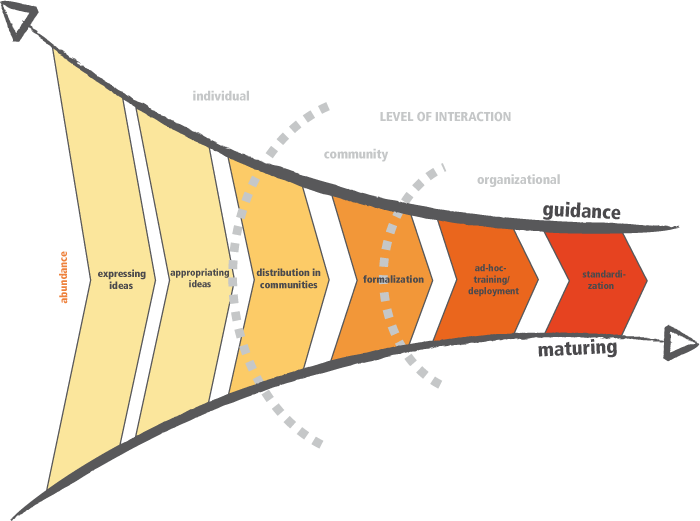 collective level can refer to different levels of granularity, e.g., a team, an organisation or a com-munity. Knowledge maturing is not the result of an individual‟s activity, but of an interconnected series of activities of interacting individuals, frequently also within different collectives. knowledge is understood as both cognitive structures bound to individuals‟ minds (becoming manifest in their behaviour) and as an abstraction of the knowledge of individuals in a collective. Ia. Expressing ideas (investigation). New ideas are developed by individuals either in highly informal discussions or by browsing the knowledge spaces available inside the organisation and beyond. Extensive search and retrieval activities often result in loads of material influencing idea generation. Knowledge is entirely subjective, deeply embedded in the originator’s context and the vocabulary used for communication might be vague and restricted to the originator. Ib. Appropriating ideas (individuation). New ideas or results found in the investigation phase that have been enriched, refined or otherwise contextualized with respect to their use are now appropriated by the individual, i.e. personalised and contributions are marked so that an individual can benefit from its future (re-)use. While many initiatives for knowledge management have focused on sharing knowledge or even detaching knowledge from humans as “media”, at least in a more individualistic culture, individuals also require support for appropriation. II. Distributing in communities (community interaction). This step is driven by social motives and the benefits that individuals typically attribute to sharing knowledge. These are, among others, belonging to a preferred social group, thus increasing the probability of getting back knowledge from the community when one needs it. From the perspective of semantics, a common terminology is developed and shared among community members. III. Formalising (in-form-ation). Artefacts created in the preceding phases are often inherently unstructured and still highly subjective and embedded in the community context. In this phase, e.g., purpose-driven structured documents are created in which knowledge is de-subjectified and context is made explicit. IV. Ad-hoc training (instruction). Documents produced in the preceding phase are typically not well suited as learning materials because no didactical considerations were taken into account. Now the topic is refined to improve comprehensibility in order to ease its consumption or re-use. Individual learning objects are arranged to cover a broader subject area. Tests allow to determine the knowledge level and to select learning objects or learning paths. V. Standardising (institutionalisation). Finally, formalized documents that have been learned by knowledge workers are solidified and implemented into the organisational infrastructure in the form of processes, business rules and/or standard operating procedures. From a learning perspective, the subject area becomes teachable to novices. Certificates confirm that participants of formal training achieved a certain degree of proficiency. On an organisational level, certificates allow organisations to prove compliance with a set of rules that they have agreed to fulfil, e.g., with service level agreements or with respect to regulations such as Basel II or SOX.